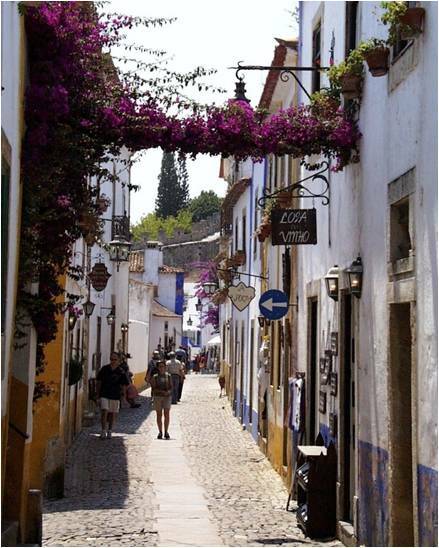 This is a typical street in the hilltop town of Obidos. This is our last full day in Lisbon (although we will return here at the very end of the tour for our flight home). We traveled north to what is known as the “Silver Coast,” a region of sleepy villages, vineyards and ancient castles. We left our hotel at 8:30 a.m. under cloudy skies. At 11:30 we arrived at a medieval hill town, a UNESCO world heritage site by the name of Obidos. We navigated the narrow streets of shops, churches and fountains to the very top, where there was an old fort. It was like stepping back in time – except for the souvenirs. After a little over an hour here, we left at 11 for the coastal town of Nazare. We were hoping for sunshine, but instead our luck ran out and we got rain and wind. The waves of the Atlantic Ocean were crashing into the cliffs as they were last week during a major storm. Nazare is the town where the world record was broken last week for the highest wave ever surfed. We saw the exact spot where all those pictures shown on TV and in newspapers last week celebrated that record-breaking surf event. The rain dampened this particular visit, but we had a nice lunch here – mainly fresh fish, because this was a fishing village before it became a very popular beach resort. Next, we toured a magnificent UNESCO World Heritage site, the Batalha monastery, which reminded me very much of Notre Dame Cathedral in Paris in both architecture and massive size. It is definitely a hidden treasure, especially because of its remote and unlikely location, built as a monument to one of the Portuguese Royal families. 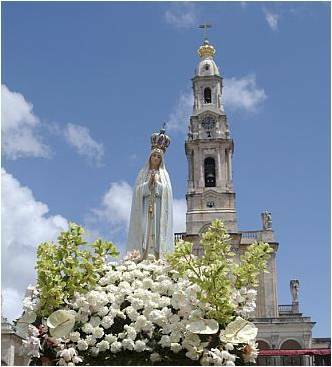 Basilica of Our Lady of Fatima showing statue of the Virgin Mary as she appeared to the three local peasant children. Finally, at 3:30 we headed for nearby FATIMA, the great pilgrimage site where the Blessed Virgin Mary appeared to 3 young peasant children 1917 and which has grown to a shrine on a par with Lourdes. As a child in Catholic School the story of Fatima was held up to us as an important message promoting the saying of the Rosary and praying for the conversion of Russia. Today I saw the exact spot where the Virgin Mary appeared and where I joined many faithful praying, lighting candles and touring the various locations on these massive grounds related to the message of Fatima. As a child, hearing those stories, I could never have imagined someday standing in the very spot where this modern miracle occurred. The rain added to the drama, but one of the things that impressed me most, because I wasnt expecting it, was that there are two sections of the Berlin Wall on exhibit here, symbolic of the fact the what we were inspired to pray for as Catholic School kids through the Message of Fatima became a reality with the extinction of European Communism and the fall of the Berlin Wall. We are now wrapping things up here in Lisbon, because we fly out of Lisbon tomorrow morning for St. Michael’s Island, the largest of the 9 Azore Islands, where we will be for the next four days, hopefully basking in the sun of the Atlantic Ocean. I’ll see how the computer technology in the next hotel will allow me to continue this blog. Take care.